After a job interview, it's important to follow up with the hiring manager. Thanking the interviewer for taking the time to meet is the most important action you can take post-interview. Here's more information on what to say and how to time your communication. If possible, collect business cards from all your interviewers. That way, you'll have people's contact information on hand. If that isn't feasible, check on LinkedIn for the job titles, contact information, and the correct spelling of the interviewers' names. If the information isn't listed, look up interviewers on the company website or call the company's mainline. A receptionist should be able to access the company directory and help you gather up details. When you are selected for a job interview, it means that you're a serious contender for the job. That's why it's important to take the time to follow up after every single job interview, including both in-person and phone interviews, and second interviews. By following up, you're reminding the interviewer that you're a strong candidate for the job and you are reinforcing the fact that you're qualified and should be given serious consideration. Your thank you note also shows that you're interested in the position. Follow the guidelines below when crafting your follow-up notes. Send a thank you letter or email message to everyone who interviewed you. It can be helpful to jot down some quick notes immediately after conversations to remind yourself of topics discussed and points you want to cover in your message. Review examples of thank you letters if you're not sure what to write. Email is the fastest way to say thank you after a job interview and it's perfectly acceptable to send a thank you email message. Consider sending a handwritten thank you note. Keep a box of thank you note cards and a book of stamps handy. It will serve as another reminder and show that you care enough about the job to take the time to write a note, put on a stamp, and mail your thank you. In some industries, such as print publishing, handwritten notes are more common. Make sure to use your best handwriting! Don't wait. 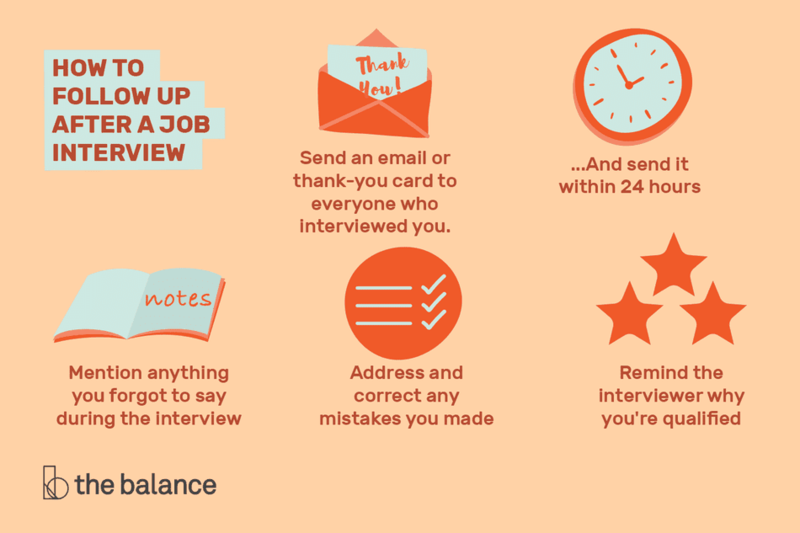 Send your note within 24 hours of the interview - sooner if you're emailing. That saying "he who hesitates is lost" can hold true when you're job searching. Promote your candidacy. Use your follow-up note to reiterate your interest in the job and the company. Tell the interviewer why you are qualified. Highlight your relevant skills that are specific to the job's requirements. What did you forget to say? If there's something you had wished you'd shared during the interview, do it now. Mention anything you wished you had said, but didn't, during the interview. Clean up interview mistakes. If you misspoke during your interview or answered a question poorly, your thank you note can be a place to rephrase and clarify what you intended to say. Proofread your follow up letters before you send them. A typo or grammatical error can knock you out of contention. Be particularly mindful of people's names — spelling those incorrectly will definitely be noticed. Even though it's easier to send a quick email, making a follow-up phone call can help your candidacy for the job. And, if the job at hand involves a lot of phone time, calling to say thanks shows you have the strong communication skills required for the position. In addition to saying thank you for consideration for your job, you can share a few of your key qualifications. If you're feeling nervous, you can make a list of points you want to mention ahead of time. Always start by saying who you are (use your full name), the position you interviewed for, and when you met. You can also mention anything you forgot to say during the interview.